You are here: Home › #oklaed › What I am For! I am for every child having the opportunity to succeed. Sometimes that is in the neighborhood school and sometimes it is in a different setting. Different students have different needs. Just like you and I. Different students learn in different ways. Just like you and I. A system that can support all learners is crucial to their development as future contributing citizens. I am for a completely different set up for the school day. Just because we alway start around 8 and always end around 3 doesn’t mean we should continue to always do it this way. Flexibility for our communities are key things. What works best in rural America may not work so well in urban areas. How about a school day that had options to run from 6:30am to 9:00pm. Staff it in a way that best suits your community. Give parents some choices from elementary schools through high school. I am for accountability. But I am not convinced that the big testing season is the best way to determine the success of a school. It’s possible that a teacher can work biblical miracles with a student in class, then that student perform at a very low level on a test. How is that fair? Hold me accountable, but lets be reasonable. Lets build a system that can monitor student growth all year long. This way we can truly see how a student grows. This is not an endorsement for high stakes testing every quarter either. This is about common sense. We have an obligation as teachers to ensure that our students get better every day. I am for professional development. For those of you who don’t teach, I cannot express strongly enough the importance of this. I get better in my craft by learning from others. Sometimes that learning requires some travel, sometimes that learning comes to a location near me. Again – common sense here. One of the best conferences I have ever attended (as a teacher) was the ISTE conference. I learned so much to bring back to my building. I was fortunate enough to use professional development money, I had a great principal who helped me here. I was one of two teachers who went, this needed to be an experience for more than two people, but it was difficult to find all of the money. I am pretty sure that we used some grant money here also. Professional development is critical to teacher growth, we must have support here. I am for standards – these tie the entire system together. With standards in place there should be no holes in the learning for students as they move from early childhood all the way through graduation. Common core standards are not that horrible, but standards written by educators for their specific state? These are even better, they can address local items and culture. Standards that were crafted by educators, then open for public feedback, then edited to make them stronger. What is wrong with this? Value the educator. Trust the educator. This is what we do every day. I am for strong curriculum. This is chosen at the local level, to meet the needs of those students attending particular schools. Please do not confuse curriculum with standards. At the same time, please do not confuse a scripted lesson as curriculum either. Teachers need the freedom to choose how to best teach the students that are in class today. Those students are different than the ones from last year and the students coming up next year. Each group has their strengths and weaknesses. Teachers need the freedom to address those items as the best see fit. I am for equity. This doesn’t mean every district has identical course offerings or athletic venues or anything like that. It means that every school district has the same opportunity as every other district. This should be a community choice, what will work best? I don’t think my own children should be held back from technology because every child does not have access to it. I also believe we are doing a disservice to our students who do not have access to technology by not providing to them as early as possible. I am for a quality teacher in every single classroom. In my state we started the year almost 1,000 teachers short. When you have such a dire situation, anybody with a pulse becomes a candidate. Create a system where teachers want to be. Some places will only consider teachers who have a masters degree in education. What kind of impact would this have on our system? I know there are amazing teachers who are alternately certified as well. Let us put together a system to make sure that only the best are teaching our students. 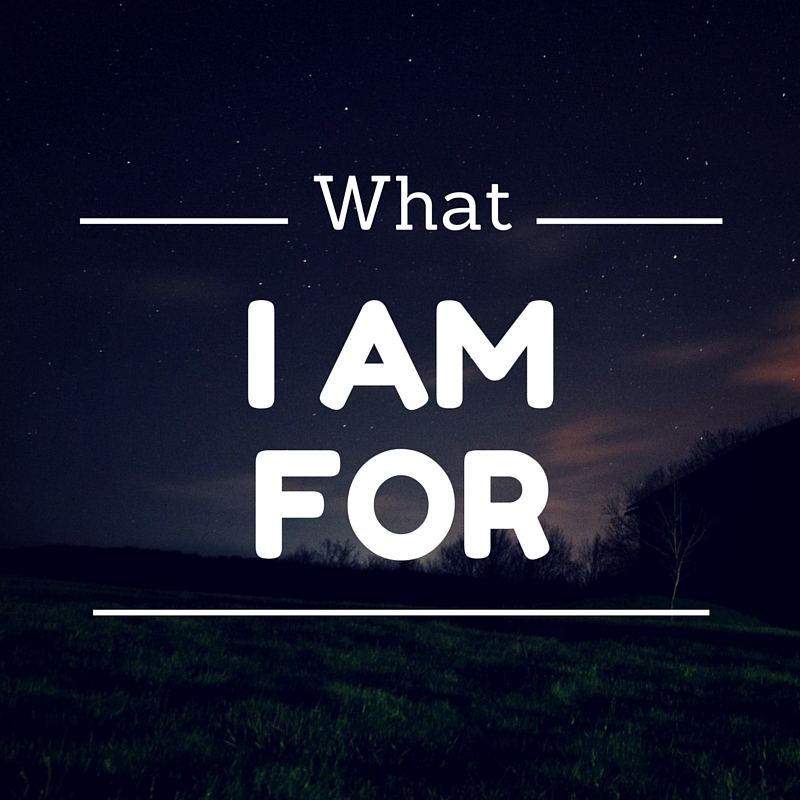 One Response to "What I am For!" I needed this today! Already thinking of my own list.